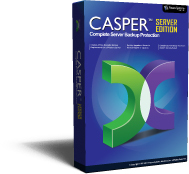 Casper Server Edition is a disk cloning and imaging solution designed specifically for use on Windows Server™ platforms. Whether you need to upgrade a server with a new disk to increase speed or storage capacity, replace a failed disk, or maintain an instantly bootable backup replacement for a server, Casper Server Edition is designed to make the process extraordinarily easy. Casper makes it easy to keep a complete and instantly bootable backup replacement hard disk or RAID array for a Windows Server. Should the server's system disk device fail or become corrupted, you can boot and run the server directly from the backup hard disk and be up and running again in seconds! No restoration required. You save time and eliminate downtime. Boot and run the server from your dedicated Casper backup device. It’s that Easy! Casper quickly clones a single disk or hardware RAID array to another disk or array to increase speed, increase capacity, or replace a failed disk or array. Supports all SAS, SCSI, SATA, ATA/IDE, and hardware RAID configurations, including solid state devices and sold state arrays. Automatically resizes partitions during the cloning process to make full use of the larger disks and arrays. Casper maintains complete disk image backups as files, which can be stored virtually anywhere, including on a drive containing other files or remotely on a network attached storage device. Should the server's system disk device fail or become corrupted, you can use these backups to choose a specific point-in-time in which to restore the server. Maintain multiple, full system backups on a single device. SmartRestore™ technology makes recovery easy. You choose which backup to restore and Casper does the rest!